Colorless or white diamonds are more valuable than light yellow or brownish diamonds, within the range of the scale above, but darker colored stones, called "fancy", are more valuable than white stones. 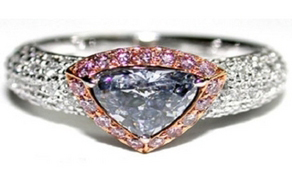 There is not a standard rating system in place for fancy diamonds, such as the prized blue diamonds. The Gemological Institute of America (GIA) is a 75 year old non-profit organization that receives and grades diamonds from all over the world. They are the originator of the famous 4 Cs of diamond quality: cut, clarity, color and carat weight. Their D through Z color grading scale, and "flawless" through 13 clarity scale are recognized all over the world. They are the publisher of the quarterly journal Gems and Gemology. The American Gem Society evaluates loose diamonds sent by jewelers and manufacturers. This service is not available to the public at large. They issue a Diamond Quality Document (DQD), which shows the Cut Grade, Color Grade, Clarity Grade and Carat Weight.